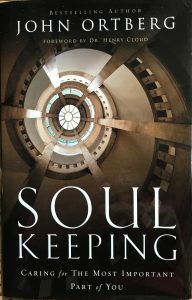 Last Wednesday a group of us from St Andrew’s joined with members of St James Bishopbriggs for the first session of a 6-part course based on the book Soul Keeping by John Ortberg. There were 23 folk who braved the wet and icy evening to start on this new venture led by Paul Watson, the Rector at Bishopbriggs, Andrea and Stephen Parratt. Paul and Stephen have both already studied this book and were keen to share it with others. Each session begins with a 25 minute DVD when the themes are introduced followed by splitting into 3 groups facilitated by Paul, Andrea and Stephen. The first session was asking the question what is the soul? A lovely story was told at the start of the film, about the keeper of the streams, an old man who lived high in the mountains and kept the streams clear and free from debris. This in turn kept the animals, plants, and people who lived in the valley, healthy. His work however was done unseen and wasn’t appreciated & so his job was removed as a way of saving money. Consequently, when the water was no longer clean & fresh, it was gradually realised that the health & well being of the natural surroundings and all that lived there, was dependent on the role of the keeper of the streams so he was reinstated and the health of the area returned. This story was used to describe the importance of looking after our souls & is a role that each of us possesses. We had interesting group discussions as people shared their understanding of the concept of ‘soul’, using the workbook questions as a basis for discussion. It was good to get together with folk from St James & we look forward to getting to know each other better as we explore the meaning of soul keeping over the next 5 sessions.